Lesa asks for her picture to be taken as her bookbag came unzipped on it's own and she had become dizzy. 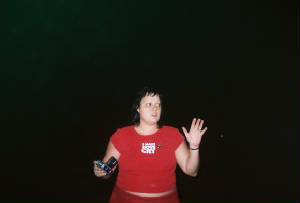 The small orb next to her left hand is unexplained. This picture was taken moments after the previous picture. 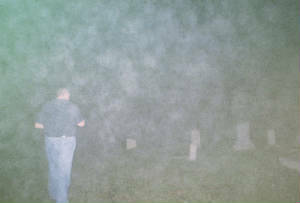 When this picture opens to full size you will see faint orbs with 2 blotchy looking orbs above the cemtery gate. These orbs are unexplained. 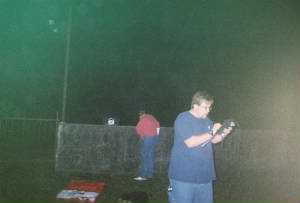 During the investigation a fog rolled in. We noticed this fog and even commented on our ability to taste it, it wa so thick. 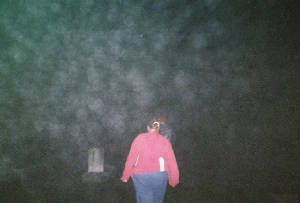 When this photo opens in full size look in the cloud of orbs, there you should see a bright orb directly above Tiff's head. Is this your run of the mill fog, or something more?